Walking is a popular activity in Ireland, for natives and visitors alike, but which are the best Irish routes to choose? Here you'll find seven of the best, namely six of the popular signposted long-distance routes, and a combined suggestion of two-day trips up Ireland's most popular mountains. Pick at your leisure, but never forget to stay safe—good walking gear is essential in any case. Taking the walker through the rough beauty of the craggy Beara peninsula, past wild mountainsides and secluded beaches, the Beara Way is ideal for getting away from it all. Though it has become more popular with individual walkers as well as organized groups over the past few years, it's not as crowded as the Wicklow Way can be, but no longer splendid solitude either. The total distance covered by the Beara Way is 196 km; a shorter route of 116 km is recommended below. For this, you should budget a duration of at least 6 days. Over this distance alone you will have to tackle ascents of (cumulated) 5300 m, some over very steep inclines. The condition of the trails can be rated as generally good, around 40 % are on paved roadways, but some wilder stretches can be challenging. Signposting may be described as erratic, missing or unreliable in some areas—never walk without map and compass. Regarding maps, you should try to get a current issue of OSI Discovery Series Sheets 84 and 85. Day 1 - 16 km from Glengarriff to Adrigole, a steep walk at times, so budget 5 hours. Day 2 - 22 km from Adrigole to Castletownbere, again with some challenging parts and taking around 6 hours. You have the option to stay a day in Castletownbere and insert an easy day of walking on Bere Island. Day 3 - 12 km from Castletownbere to Allihies through the Slieve Miskish Mountains, 3 hours of fairly easy walking. Allihies could be your base for a day if you want to visit Dursey Island, accessible by cable car only. Day 4 - 20 km from Allihies to Eyeries over old mining roads and past standing stones, budget 6 hours time. Day 5 - 22 km from Eyeries to Lauragh, across the steep flanks of Gortbrack, past a number of prehistoric sites and some almost subtropical vegetation, 6 hours of sensual delights. Day 6 - 24 km from Lauragh to Kenmare, along the sides of the Caha Mountains and Lough Inchiquin through a landscape full of variety, 6 hours minimum due to some steep inclines. Practical advice—always carry maps, a compass, and enough food and drink for the whole day. The Burren Way is not challenging physically but can be mentally as you are walking through a “moonscape” that even depressed English conquerors, for lack of execution facilities. The total distance covered is 123 km, and you should budget for a duration of around 5 days. Over the distance you will have to tackle mainly moderate ascents, without any long, steep inclines. The condition of the trails can be rated as good to very good, large parts of the Burren Way are on paved roads. Signposting may also be described as good. Regarding maps, you should try to get a current issue of OSI Discovery Series Sheets 51 and 57. Lahinch to Doolin - 18 km following the coastline on top of the Cliffs of Moher, ending in Ireland’s overrated “folk music capital.” You should budget for a duration of around 4 hours. Doolin to Lisdoonvarna - 12 km, taking you away from the coast, a walk of around 3 hours. Lisdoonvarna to Ballyvaughan - 25 km across the Burren, with splendid views of the Aran Islands and Galway Bay. 5 to 6 hours of quiet, between two tourism hotspots. Ballyvaughan to Carron - 25 km of trail take you further inland, past many prehistoric monuments, for around 5 to 6 hours. Carron to Corofin - 18 km through a grey and uninspiring landscape … those not that interested in the Burren can skip these three hours and also the day before, honestly. Practical advice—​the Burren is grey and literally not easy on the eye, tiring and leading to a trance-like state. To avoid accidents on roads, walkers should wear colorful, bright clothing. Always carry food and drink, there are no snack bars on the trail! Those wanting to go up a hill, for the view, or as a challenge, can find happiness in Kerry and Mayo—Ireland's highest, and Ireland's most important, mountain are there for the climbing. The ascent to the top of Carrauntoohil in County Kerry, with 1038 m Ireland’s highest mountain, is a daytrip for those visitors that have experience in hillwalking, and the right footwear to tackle the mountain. You should budget for a duration of around 4 hours for the ascent, 6 to 7 hours for the whole venture. The condition of the trails can be rated as good in many parts, but the Devil’s Ladder is challenging with no definite trail. There are no signposts, but you’ll see the trail(s) left by other walkers. Regarding maps, you should try to get a current issue of OSI Discovery Series Sheet 7. Climbing Croagh Patrick, also known as “Ireland’s holy mountain” due to its association with Saint Patrick, is basically a day trip when visiting County Mayo—up, and down again, travelling in Patrick's footsteps. But while it may not take long, it will be tiring. And at time dangerous if you to not take care where you step. You should budget for a duration of at least 2 hours for the way up, the same for the descent. Over the distance you will have to tackle some very steep ascents, especially coming up to the mountaintop. The condition of the trail can be rated as not very good, in parts downright bad—the “path” is often made up of scree, ready to slip under your foot (and then your knees and/or bum) at the slightest provocation. On the other hand, you’ll need no signposting, the way is so well-trodden you can’t miss it. Equipment recommended includes food, water, and a sturdy walking stick – you can hire them at the foot of the hill in Murrisk, near Campbell’s Pub. If you see you climb of Croagh Patrick as a sporty endeavor, not a pilgrimange, you may want to avoid holy days, and especially “Reek Sunday”—the last Sunday in July is the focus of most pilgrimages, and the hill is chock-a-block with clergy, praying pilgrims of all ages, and mountain rescue and medical teams for those that overestimated their abilities. 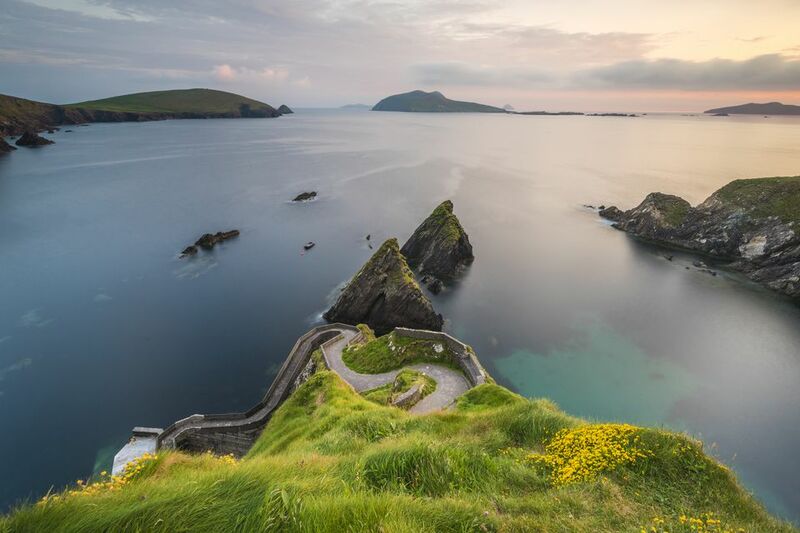 Dingle, the town and the peninsula surrounding it, is a tourist favorite—so much so that the local councilors even petitioned the government not to use the Irish name as not to confuse non-Irish-speaking visitors (i.e. 99.99%). Dolphin Fungie is a big draw, but to get away from the crowds a walk on the Dingle Way is recommended. The total distance covered by the Dingle Way is 168 km, and you should budget for a duration of around a week, depending on your fitness. Over this distance you will have to tackle ascents of (cumulated) around 2590 m, including some quite steep passages. The condition of the trails can be rated as overall good, the same goes for the signposting. Regarding maps, you should try to get a current issue of OSI Discovery Series Sheets 70 and 71. Day 1 - 18 km from Tralee to Camp, along the foothills of the Slieve Mish Mountains entlang. Day 2 - 17 km from Camp to Annascaul, with views of Inch (with ts long, sandy beach), and through the Gap of Maum, where an ancient standing stone doubles as a trail marker. Day 3 - 21 km from Annascaul to Dingle, via Killmury Bay, and across the steep and high Connor Pass to Dingle, maybe the toughest part of the route. Day 4 - 20 km from Dingle to Dunquin, via Ventry Beach and Mount Eagle to Slea Head. Day 5 - 24 km from Dunquin to Cuas, almost a level walk along the Atlantic coast, via Coumeenoole Beach (where “Ryan’s Daughter” was filmed) and Smerwick Harbour. Day 6 - 18 km from Cuas to Cloghane, using a military road across the mountains, crossing them on a pass just below the top of Mount Brandon, then downwards to Brandon Bay. Day 7 - 25 km from Cloghane to Castlegregory, following the north coast on an easier path. Day 8 - 25 km from Castlegregory to Tralee, still along the north coast, then across foothills of the Slieve Mish Mountains back to Tralee. Practical advice—if you are walking the Dingle Way, make sure to book convenient hostels, B&Bs, or hotels in advance. For the trail between Cuas and Cloghane note that crossing the pass in bad weather is not recommended. The Cooley peninsula is one of the most underrated areas of natural beauty in Ireland, and the Tain Way (named after the “Cattle Raid of Cooley”, an ancient, epic poem) is maybe the best approach to exploring it in depth. The total distance covered by the Tain Way is around 40 km, so you should budget for a duration of around 2 days. The route runs from Carlingford via Omeath and Ravensdale through the mountains, then across the Golyin Pass back to Carlingford. Over the distance you will have to tackle some challenging, though not difficult ascents. The condition of the trails can be rated as “mixed”, from trodden path to paved road. Signposting may be described as quite good. Regarding maps, you should try to get a current issue of OSI Discovery Series Sheet 36. Practical advice—the Tain Way is generally regarded as an easy trail, but it is no picnic. Stout footwear and some weather-resistant clothing are a must, especially as consitions can change in a few minutes. There can be no doubt that the Ulster Way is the most challenging of Ireland's way-marked routes, by virtue of length alone—it explores the Northwest on no less than 1000 kilometers of tracks, ways and roads. Here it is only possible to give a general overview of the route. The condition of the Ulster Way, including the signposting, is generally good—the whole system was overhauled a few years ago, and is generally kept in good nick. Unless you really want to spend a few weeks rambling in Northern Ireland (and a bit of County Cavan), pick the best of the Ulster Way only. Highly recommended are the easy Lagan Towpath from Belfast to Lisburn (19 km), the stunning Causeway Coast Way (52 km from Portstewart to Ballycastle), and the route from Florencecourt to Belcoo (16 km). The Causeway Coast Way is (maybe) the most exciting part of the Ulster Way, leading along the north coast from Portstewart to Portrush, then past Dunluce Castle to the Giant’s Causeway, on to the famed Carrick-a-Rede Rope Bridge and finally via Ballintoy to Ballycastle. The route from Florence Court to Belcoo (16 km) uses the Cuilcagh Way through the UNESCO Geopark—through woods and on byways you’ll walk to Florence Court, then via the Florence Court Forest Park to the Marble Arch Caves, then across exposed moorland 665 m up the Cuilcagh Mountain, descending via Cladagh Glen to Blacklion and Belcoo, twin towns on the border. The Wicklow Way is one of the best-known and most popular waymarked routes in Ireland—right outside Dublin and leading through an astonishing landscape with lush woods, waterfalls and high, windswept bogs. It actually starts on the outskirts of Dublin and then down to Clonegall via Knockree, Laragh, Glendalough, Glenmalure, Drumgoff, Aghavannagh, Tinahely, and Shillelagh. At a length of 127 km, it can be tackled in a full week. The difficulty of the trail is changing all the time, but it is manageable for those with hillwalking experience. Though there are some strenuous parts, it has to be said. Markings can be a bit hit and miss, mainly due to neglect (this has become less of a problem) and vandalism. For really decent maps, get the Wicklow “Adventure Series” map bundle from OSI. Some safety advice – even though the Wicklow Mountains are near Dublin, and at first glance are a mere succession of minor hills, they pack a punch. As an elevated plateau with some higher outcrops they reach nearly 1,000 m at Lugnaquilla. The most underrated danger here is a sudden change of weather, from bright sunshine to dense fog and clouds within a short time. This will not only let you lose your bearings easily, but it will also be harsh on those optimistic leisure walkers that set out in t-shirt and light trainers; there are a number of mountain rescue teams active in the area for this reason.